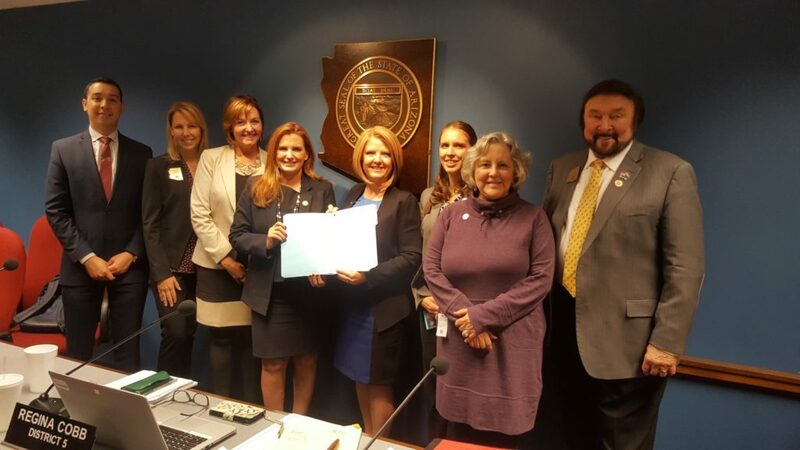 The Arizona House Health Committee passed the Arizona Opioid Epidemic Act in January 2018. In the wee hours of May 3, 2018, I proposed a budget amendment to use $56 million in federal childcare subsidies to restore part of that $80 million in state funds that were swept. These funds would have dovetailed nicely with tiered reimbursement for high-quality childcare bill that was passed in 2018 but had no funding attached to it. Despite the crushing need for childcare subsidies, the amendment was rejected on a party line vote, and Arizona became the ONLY state in the US not to use these federal funds to help our families living in poverty. A few months later, a lobbyist told me that one powerful man stopped these funds from being used. Where’s the fairness in that? How can we allow one powerful man’s opinion to force thousands of single mothers and their children to live in poverty? How does that promote the common good? It doesn’t. Last summer, I read the book Envisioning a New World: Awakening to Life’s Oneness by Unitarian Universalist Rev. Rosemarie Carnarius. In it, she applies the concept of balancing yin and yang to public policy. Taoists believe that to lead a healthy and happy life one must seek balance. Carnarius suggests that to have good government we should try to consciously balance social responsibility—the yin—with individual liberty—the yang. With this model, policy is not about who’s right and who’s wrong. It’s about balance. This sounds simple yet so profound. Doesn’t it? Carnarius goes on to point out that our Declaration of Independence is the first document in history in which “… an individual’s right to life, liberty and the pursuit of happiness was proclaimed as divinely ordained, unassailable, and constitutionally guaranteed.” This was a huge step for the common man. Democracy—the voice of the people—would balance the rights of the individual. To help keep this delicate balance the founders added a free press to educate the public. In fact, President Thomas Jefferson valued newspapers so much that he proposed mailing them to all Americans for free, so they could be educated about current events and the government. So, what happened to our Democratic utopia? Individual liberty and social responsibility are out of balance. Big money politics, voter suppression, disinformation, and the slow death of the free press have adulterated our democracy and put special interests in charge of our government. If you look at many issues—like gun violence prevention, school choice, environmental protection, or healthcare– it is obvious that in many cases individual liberty is being promoted over the social responsibility and the common good. As a result, lawmakers often pass laws that are contrary to the voters’ wishes. In fact, in the Arizona Legislature, it is shocking how many bills we hear—and pass—that are crafted to benefit one corporation or one special interest group. It’s no wonder voters are frustrated. Congress has perpetually skirted meaningful gun reform, and nearly every bill that expands gun rights passes the Arizona Legislature. On Second Amendment, individual liberty is sacrosanct. Unfortunately, tipping the scales so heavily toward individualism has made us less safe as a country. A recent CDC study looked at 10,000 homicides of women and found that half of these women were shot to death by their male partners. Along the same lines, recent research on violent death in 23 high-income countries revealed that 90% of the women who died a violent death were killed by a firearm in the US. And 80% of the children who died a violent death were killed by a firearm in the US. This is unacceptable. In 2018, after the Parkland Florida shootings, students representing March for Our Lives descended upon the Captiol and pushed for common sense gun reforms. For weeks, Democrats negotiated with the governor and our Republican colleagues, but there was no consensus and no movement on gun violence prevention. Maybe next year, we can find some balance on that issue. The battle over healthcare insurance reform is another glaring example of the imbalance between liberty and responsibility in public policy. Since the early 1900s, many special interest groups have fought successfully against meaningful health insurance reform in the United States. The Affordable Care Act was a major step in the right direction because it increased health insurance coverage dramatically; it eliminated pre-existing conditions; it eliminated gender-based price discrimination; it eliminated lifetime insurance caps; it mandated a basic healthcare package that focused on disease prevention; it capped health insurance company profits; and it included fees and taxes (primarily on the wealthy) to make it self-sustaining. The Affordable Care Act was an attempt as balanced policy. Unfortunately, as the ACA played out and insurance companies dropped out of the exchanges, it was obvious that reform was needed. For several years, the Congressional “reform” plans have focused on: 1) Repeal of the ACA with no alternative plan, 2) Repeal and replace, or 3) Death by 1000 cuts to collapse the insurance system. Last fall I organized the 200 Stories Healthcare Forum. More than 75 Tucsonans came together to share their medical stories. When asked how they would describe their ideal health insurance plan, they said it should be universal, affordable and fair. Overwhelmingly, the attendees said that healthcare, health insurance, and drugs were too expensive, and that access to care and drugs was too limited. There were many complaints about narrow networks, surprise billing, balance billing and an overly complicated system. Although health insurance coverage increased dramatically after the passage of the ACA, medical bankruptcy is still a major problem. Far too many people are underinsured because they are buying the insurance they can afford—not the insurance they need. Denying access to affordable healthcare results in unnecessary disease and premature death. It doesn’t do our communities, our state, or our country any good to allow our people to live in poverty and sickness. The Affordable Care Act was an attempt at balanced policy. Let’s fix it—instead of allowing special interest groups to kill it. Here at home, Arizonans need affordable options and improved access to care. That is why I joined Rep. Kelli Butler when she proposed a bill to allow Arizona residents to buy-in to Medicaid. This would be like an Arizona public option that is more affordable than the Affordable Care Act. The Taoists believe that to attain health, we must have balance in our lives. Without balance, there is dis-ease. Are the anger, the bullying, the hatred, and the violence that we see in our country just symptoms of our societal dis-ease? I touched on only a few policy areas today. If you think about this concept of balanced policies, you’ll realize that many of our country’s and our state’s policies are out of balance because they are not aligned with needs or desires of the general public. It’s no wonder people across the political spectrum say that the system is broken or rigged against them, and that they feel left behind or left out. Could balanced public policy calm the tension in our country by bringing fairness to the lawmaking process? I say, it’s worth a try! In my opinion, it’s time to say “no” to special interest groups and “yes” to what’s good for the people. Jay Lawrence? Ugh. Regina Cobb? Who was in favor of dental service deserts while carrying the water for the Dental Association? The problem in health care is the medical mafia has control of the cash register which only those victimized know the details about. Much of care delivered through the the health care system is unnecessary and is created to make money. I would make this claim after being a nurse for four decades and know the term “cash cow” is the dream child of the system itself. Over and over technology creates more and more advancements which get used on people dying, and in general terms, would die anyways. The Medical Mafia is a state of mind which protects physicians and systems of profit to basically do what they want regardless of the complaints and evidence of blatant injuries. The system creates its own business by using patients, over and over, through unneeded procedures that frequently cause harm, which the system also collects on. The Medical Mafia fixes complaints through attorneys and physicians and administrators and regulatory agencies and record keeping departments, and more. Nurses who complain frequently find themselves meeting the Medical Mafia AKA the AZ Board of Nursing and the Az Medical Board. Agencies that punish a few and no violation was present , while taking care of “their own type ” should absolutely never be !! when the Az Board of Nursing can continue under the guise of “public safety ” , when they are targeting a nurse / np who has reported an unsafe facility or condition. Nurses are not able to speak up to protect themselves , or their patients. A nursing board who interest is to protect hospitals money , is torture .